This is a project full of interesting fibers, textures and techniques. 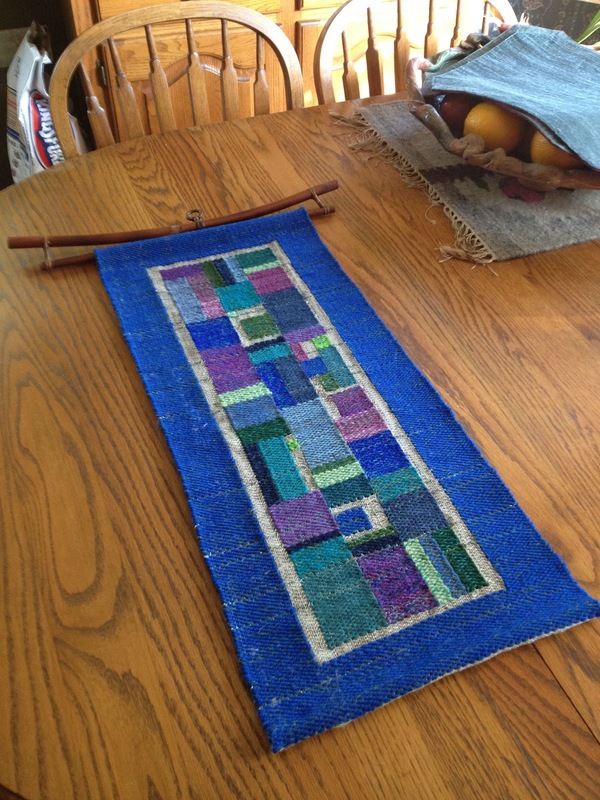 The idea was in an older book from our Tulsa Handweavers Guild library, Weave a Weave by Malin Selander. It is no longer in print but I do see it offered on Ebay from time to time and I was able to get a copy from a used book source. It is full of interesting projects, and this one is based on a transparency with an inlay technique called "Ryss" weave. 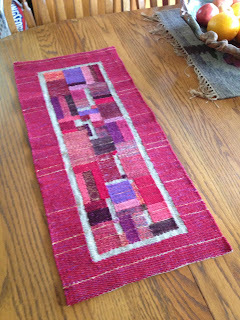 I suppose what attracted me to it was the bold areas of color and the fact that it called for tapestry wool which I happen to have in abundance. I have taken the pictures on the table as a runner but it would also work as a wall hanging. 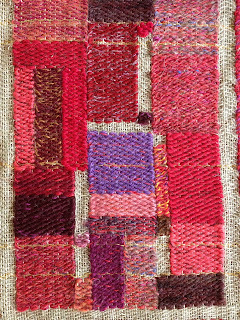 The warp for these pieces has 4 different linen threads, unbleached linen 16/1 and 16/2, and unbleached tow linen 6/1 and 8/1 which gives the warp textural interest. The sett is fairly open at 12 threads per inch which allows for the transparent feeling where the warp shows. 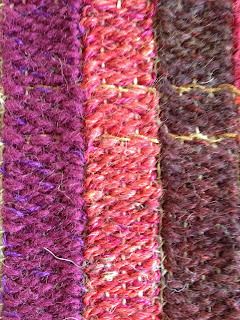 The wefts are one strand of tapestry wool (I used my handspun singles and plied) with one strand of 16/2 linen in a contrasting color. There is also some metallic thread in the wefts and the 16/1 is used like a tabby between inlay picks to hold it all together. I did the cool one first and also include a detail picture. Next I wove a warm version of the same idea just laying in the areas of color as I went and improvising the layout. 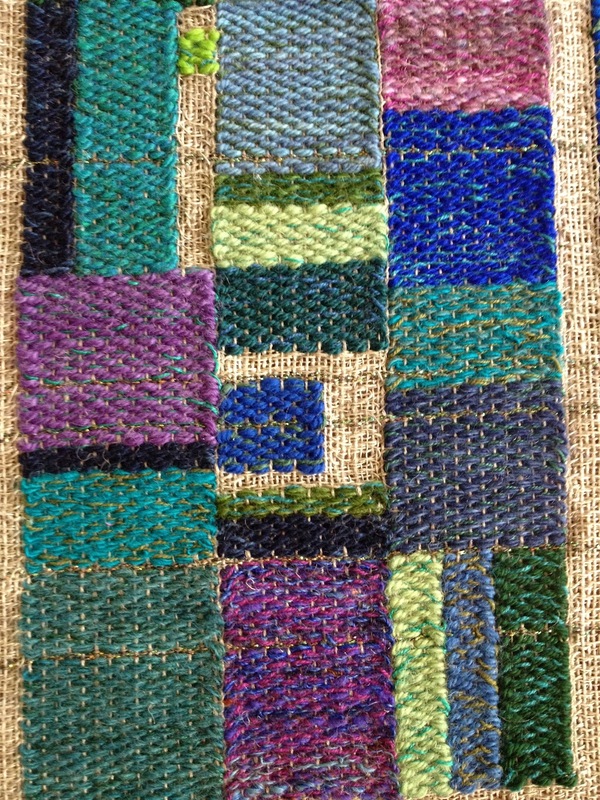 I really enjoyed the visual effect of the combination of textures provided by the wool and linen combinations. As a result of my newfound interest in transparencies my friend Lynn Tedder gifted me with a book from her library, Sheer Delight- Handwoven Transparencies by Doramay Keasbey. It is a lovely inspirational book and now it is my ambition to try a pictorial handwoven transparency. At this time I have only made a few sketches but I look forward to giving it a try. 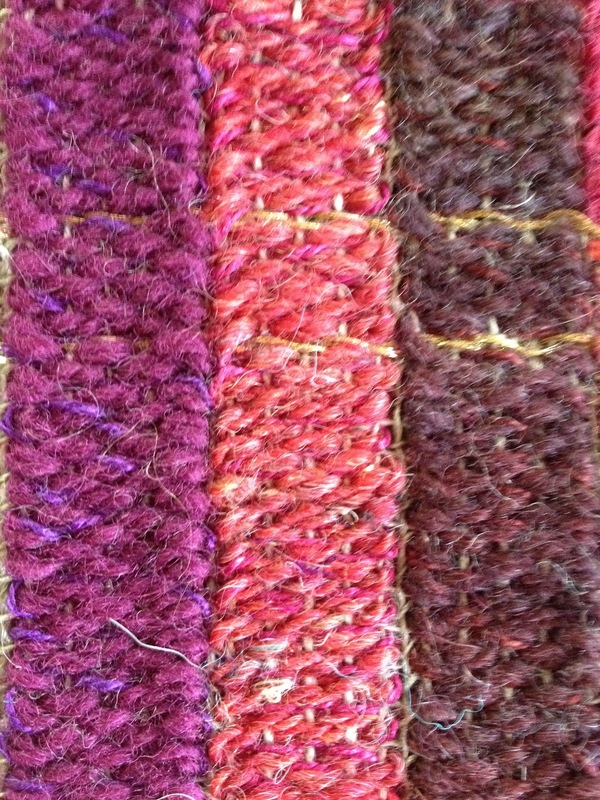 Here is one last detail showing the yarns a little better and the metallic thread picks. Dear Tapestarian Janette: Wow, just Wow!!! How do you repeatedly come up with such beautiful ideas AND implement them too? Nice! I love the colors and the contrast of the textures. Wow! I thank all of you for the encouraging words.